The Voxnan is a river situated more or less in the middle of Sweden, or rather in the southernmost part of northern Sweden, that is popular among whitewater canoeists. It is a long stretch of river through woodland without the accompaniement of a road. This is otherwise very common, especially in southern Sweden. The headwaters being only some 400 kilometers north of Stockholm, it is also more accessible for people in this densely populated area than the great northern rivers. The stretch between Rullbo and Vinströmmen with some 55 rapids seemed a perfect place to practice my packrafting for a couple of days in May. Getting the ship in shape at Rullbo. This is a bit downstream of the actual headwaters, but it is where the whitewater sort of starts. I was driven there by Christoffer from Voxnadalens Canoe & Camping, leaving my own car at Vinströmmen, where I planned to end my journey. "The Canal" showed up pretty soon, after a couple of smaller rapids. It was actually the only rapidI scouted, before I had developed a feeling for what the rapids where like and what my own rusty paddling skills were like. It is a grade IV rapid and was very easy and straight forward to paddle. Not many rocks to avoid at the current water-level (which was bit lower than average), and the biggest challenge probably that once you are committed you cannot eddy out and comtemplate life or the rapids. It runs like a train for a couple of hundred meters. So I had to switch modus operandi; I made a hole in the fabric with a needle and then pulled a short piece of soft wire through the hole instead of the floss. It took a while, since the holes in the rubberized fabric closed quickly, making it necessary to attempt the trick about ten times before getting the wire through. Three short lengts of wire pulled through this way closed the the 10 cm rip to a reasonable degree. This done I duct taped both sides and paddled on in the evening. The preliminary fix lasted about one hour, then the duct tape was gone; first the outside pieces and then on the inside of the raft as well. The pieces of wire, however kept the rip semi-closed. That is, water kept running into the raft and I had to stop every 15 minutes or so and dump 25 liters or so from the packraft to keep it from growing extremely sluggish in the rapids. It was not as problematic as could be expected to sit and paddle in 5-10 cm of water, but it was a chilly evening and the water was cold, so I had no trouble keeping myself from laughing. At camp that night, after putting on dry clothes and generally thawing out with some noodles and beer sausage, I fixed the rip more permanently. The Aqua Seal that comes with the Alpacka repair kit takes 10-14 hours or so to cure, so doing it overnight has its advantages. Which of course is why I did choose a couple of hours of wet paddling before setting up camp instead of stopping for the night where the rip occured. First camp on a greyish evening, with rain more or less proximate as the day faded. The tent is a Gossamer Gear The One, the tarp a silnylon Tentwing from Tatonka. Cooking was done on the Bushbuddy. Pretty excellent in these surroundings, but not so hot (or maybe too hot) in the tent. With a separate tarp for cooking it works like a charm in any weather. A separate tarp is pretty handy in country with people habituated bears, where it is advisable not to cook where you sleep. Bears are no problem whatsover for campers along Voxnan, though, although there are bears in the forests here. And wolves as well. I did not see them, and neither will you. Compared to a canoe the packraft is extremely easy to portage past rapids that look too overwhelming. You literally take it under your arm, at least if you have a lightweight pack, and walk, in this case some 100 meters past a grade VI. After a thundershower that evening, when I more or less fell asleep in my tent, it cleared up and I ventured outside. That certainly was a stroke of luck. A glorious spring evening followed. I lighted a small fire down by where the river widened out and reflected the setting sun. All the sounds of a spring evening by a forest lake surrounded me as the day slowly went home. The morning after was no less glorius. I had breakfast down by the faded coals from last nights fire and watched the morning mists give way to a warm and sunny spring day. Lunch breaks consisted of drying out the wet suit stuff (it did not really work) and wearing dry clothes to get warm. I brought a long sleeve sweater, shorts, socks and gloves made from thin neopren, and wore my raingear on top of this. This was barely enough to stay reasonably warm while paddling on the first 1,5 days. The last day, when the sun was shining, it was much better. However, it made me consider some other clothing for extended packrafting in less than summer temperatures. I have consequently invested in a 790 gram Ursuit MPS drysuit made from Goretex. This will replace 600 grams of neopren and 200 grams of rain pants on future trips. Maybe even my rainjacket. I have yet to test it, but the feeling is that it will keep me both more comfortable and safer in cold weather packrafting. I used a couple of 3 l Ziploc bags for map, GPS, camera and Solar Power Monkey and attached slave. A loop made of duct tape at the corners of the bags made it easy to fasten them to the pack on the 'front deck'. Sad to say they did not keep my gear dry, so I have already invested in two Ortlieb waterproof mapcases for the stuff I need handy on deck on extended packrafting trips in the wilderness. I only saw this one beaver in front of my packraft. However, I saw it for a long time and it was my first beaver sighting. After the first frantic scuffle to get the camera out before it scarpered I took a number of photos, none of them particulary sharp. I then paddled on, and it dove. I supposed that was the end of it and thought no more of that until it surfaced 25 meters ahead of my packraft and swam there for a while. Then it repeated the process, dove and resurfaced in front of me and accompanied me for another hundred meters or so. Then it disappeared for good. Maybe it wanted to check that I did not sneak of with any birches, unauthorized. The last rapid, Vinströmmen (The Wine Stream) graded class IV, ends this rapid dense part of the river Voxnan. I do not think it was a grade IV on this day, the water was a bit low, but it was fun to paddle nevertheless. Summing up the 45 hours spent on or near the river it totaled to 3 rapids grade IV and the rest more or less 50% grade II and grade III. There also where a couple graded VI or more that I portaged. I had no problems in any of the rapids I paddled, unless you count getting more or less stuck on some rocks in shallow water now and then and getting thorougly sprayed on a number of occassions, but that is par for the course as far as I am concerned. Gettting stuck was most frequent in the grade II rapids, but usually I could wriggle and pole myself free. Only on one occassion I had to get out in the knee-deep water. I certainly re-learned what a tough and also forgiving vessel the packraft is in the hands of an amateur. Taking a canoe down these rapids will undoubtedly take a different level of skill, since running into any rocks at all is not what you want to do, while it is part of the package for a packrafter. At least for this packrafter so far. Great trip, and certainly a good preparation for your upcoming adventure! Class IV rapids? Wow, judging from the photos they don't look like Class IV at all, but that likely is my limited experience. On another note, have you ever managed to capsize in a packraft (except that one time last year?)? I figured on my last day packrafting, going down a Class I rapid of 1,2 km length which had very deep haystacks, that those could be quite treacherous, especially without gear on the bow. Add in some wind coming in your direction and it would be easy to flip over when going through deep haystacks. Fantastic trip and report. A real confidence booster for 'the real thing'. Good luck! Yes the comments work :). Really rally great trip Jöregn. Such trips are the best training for upcoming trips. I'M planing to go rafting next week in Austria to learn some skills in whitewater. We have no water in the rivers in germany and paddling on a lake is boring. Your new drysuit looks fantastic. This could be a really good option for rafting in colder seasons. A packraft is tempting but location makes me think it will get limited use, time will tell. Very inspiring trip report! I can't wait to get my own boat!!! 1) it requires other clothing worn over it to protect it and that will make it hot in the summer and somewhat fights the idea I have about drysuit. 2) I don't think it's a multiuse item as I believe that the socks will wear out very fast if walking with the suit. 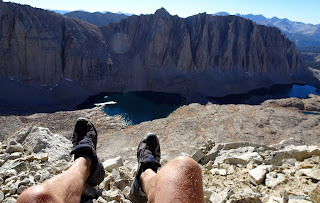 Think about walking with odd fitting socks made of Goretex Paclite... Though it might be possible to cut the socks away and add latex gaskets with neoprene covers. 3) I hope that I'll have also other use for drysuit than packrafting so a more beefy suit might suite better for my needs. Hendrik: We fooled around a lot with Xavier's Denali Llama last autumn in class I and II and couldn't capsize it even in the big waves. I recon that they do capsize but I'm quite confident with the stability of a packraft. Especially the new models with long tails look great. Oh, and I've also broken a needle but it was at home when trying to sew some leather with inappropriate needle. Though I also carry a spare needle with me when backpacking. Or actually I carry three different size needles. They don't weight a thing. Great report Jörgen. It's nice to read a more realistic account of a packrafting trip - often people tend to skip over the repairs, splashings, and low water shenanigans. The dry suit looks good, but why does everything to do with water activities have to be so damn expensive? As soon as you get involved with anything that floats equipment costs seem to multiply by a factor of 5. Like I wrote, I suspect that the water level was lower than average, making the rating a bit higher than the reality. I am not really experienced enough to have a definite opinion. The paddling guide I used (http://www.kanot-camping.se/pdf/ledbeskrivning2.pdf)and it had the ratings I have referred to in the text. I suppose the rating should apply to open canoes, since this is usually what is used on the Voxnan. However, a class I with haystacks like Hendrik described sounds like something with very high water levels that should have a higher grade. Normally a class I would hardly be noticable. It is not only water levels and the speed of the water that determines difficulties, but also the amount of obstacles encountered and the subsequent need for rapid rock/hole avoidance. There was plenty of this in the Voxnan, but on the other hand, the river was small, so tricky hydraulics and undercurrents etc were no problem. Yankee Jim Canyon in the Yellowstone river, which I paddled a couple of times on the BPL course just a few days after Ryan J shot this video (http://www.youtube.com/watch?v=k6sVf0ueTZc) of him and Andy Skurka, is Class III+. Now, the Yellowstone is a big river at this point, running through a narrow canyon. So it looks pretty scary, I can promise you that. However, the run is fairly straightforward, you just go with the flow, pick a nice tongue, lean forward and paddle like hell to pull through the white stuff. No split second manouvering between rocks that I can recall. So, to sum this up I would suspect that the rating at the time of my trip was lower than the standard rating for the river. I feel extremely safe in my packraft; lean forward and paddle vigorously and you'll get out of almost anything is my current impression. Flipping happens backwards, usually at an angle. But of course I am an amateur, paddling ordinary little rivers, do not compare me to the supermen on diverse Youtube-films. Something wrong with the comments function again, I have been trying to post these comments since yesterday. Sigh! I tested the function of my drysuit this weekend and I feel very confident in having it for my upcoming trip this summer. I will post more on this trip very soon. The suit will undoubtedly puncture in the feet if used for extended hiking, even if I will of course wear my shoes outside the suit. But my guess is that holes like that can be fixed in the field, since I have stuff along to repair the packraft. 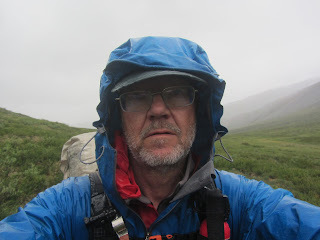 However, I do in fact plan to bring a rainjacket for the hiking as well as for packrafting when the suit is too warm and the current slow, but skip the rainpants. Should hiking without rain pants turn out to be too cold, (which has happened to me) the suit is a backup. A cuben fiber tarp used as a rain skirt will also be a backup for the groin and legs. The main thing is that I will be hiking a lot less than I will be sitting in my packraft on this upcoming trip. On the other hand, should I flip and lose my gear I will be a long way from anywhere, which means I will rather be in a drysuit than in a wetsuit. So it is a special situation. Thanks for the answers, Jörgen! The water level definately affects the rapids but in some cases low water can make rapids also harder. I guess that even though the classification scheme is the same there are national differences as at least in Finland the rapids are classified by authorized personnel of the Finnish Canoe Federation. And I don't think there is a lot of global control to make sure that the classificcations match. In addition, Hendrik's and my opinions can be also affected byt the wilderness gudie schooling system, Hendrik (soon) being one and most of my knowledge coming from guides or aspiring guides. In guide training safety plays a huge role. While many packrafters come from backpacking background thus often having more relaxed attitude towards white water. Or at least that is how it seems. I think that the Ursuit MPS will work well for the intented purpose. I'm also planning to packraft about 70% of the total distance and time so I'd also prefer to have a drysuit. At the moment I'm concidering Ursuit AWS 4-Tex (can't affor Goretex version). Any idea about the weight? I'm sure there is plenty of leeway making ratings of rapids a not too scientific endeavour. And of course, different schools and courses do emphasize safety. And well they should. The other side of this is of course that no park ranger, wilderness instructor or any other official person will ever be accused of telling people to bring too much gear into the wilderness. But telling people to leave some stuff behind could sooner or later land them in trouble. One reason why lightweight backpacking is not always welcomed by the backpacking establishment? I do not know the weight of the Ursuit you mention. They have no weights on their webpage. I was just lucky running into a friend kayaker one night a couple of weeks ago, when taking my packraft for a breather. He mentioned the suit, which he had bought, so I could look at it and weigh it in his kitchen before buying. Hey guys, great trip report (Voxnan well known to me) and discussion, and uhh, withwater classification, a topic on its own. Hope I have the time to cover it some day at my point of view/expericence. For now, I have only two references of Class IV, Minute 2:05 failed (eg, how to capsize a packraft ;) and minute 3:05 managed. Interesting. Nice films. Comparing the different styles when packrafting respecively kayaking in the second film feels particulary valuable. What are your comments on this? 3. Catching eddies (no sharp edges on the boat) can turn into something like swinging out of a train on a traffic sign pole (= the paddle only). Often not to manage at all, and catching eddies is all about whitewater running! On the other hand, I like to say: use the disadvantages. I was impressed by the manouverbility of the packraft in your films. I'm trying to learn that kind of control and it is definetely inspiring to see that it can be done. Yes, I do read a bit of Germen, please send info. I go a bit back and forth between Finland (korpijaakko.wordpress.com) and Sweden (fjaderlatt.se) on this one ;)A lot of control comes from using side stroke technics. Also worth checking: Catching eddies of a primary kayaker in a packraft :) reference on http://tinyurl.com/3fherzx (Minute 0:35 ) as well as the later part of the film on http://tinyurl.com/43cueuyIt. Is all about fluid dynamics (read the water), paddleling technics (Utilizing different strokes) and packraft specifics (be aware of the boats characteristics). I think for everyone in a packraft it is a good idea to try a kayak. Less forgiving, thus in need to adapt to the current. I ll sent that article to you.